Welcome to the website of H & B Financial Group, Inc. H & B Financial Group, Inc. is a full service, independent financial planning and investment management firm. 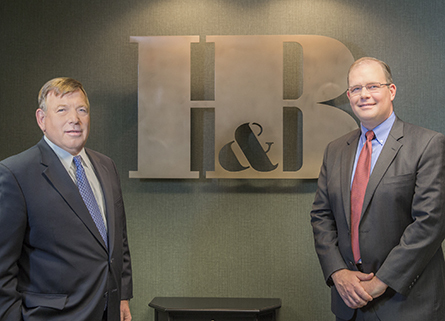 Our principals have a unique set of qualifications that separates H & B Financial from other financial planning firms. In addition to holding the requisite securities licenses, Mike Hainer, the firm's founder, is a graduate of the University of Michigan Law School, and Doug Burgdorf is a Certified Financial Planner. With these unique skills, H & B Financial is able to provide comprehensive and coordinated financial and estate planing services for our clients. In fact, the firm was founded in 2000 ago to meet the need for those comprehensive and coordinated services. Mike Hainer is also a partner in the law firm of Hainer & Berman, P.C, which he founded over 25 years ago. Mike's practice areas include estate planning and counseling small to medium sized businesses. While working in those areas, Mike became convinced that he could service the financial needs of his clients better than other financial planners, who, in Mike's opinion, would often place their clients in investments that had risk levels that were not appropriate for those clients. In fact, Mike often found himself preparing estate plans to preserve his clients' assets while the recommendations of certain investment advisors would place those assets at considerable risk--sometimes with severe adverse consequences. To better service the needs of his clients, Mike became securities licensed and formed Saber Financial Group, Inc, (the predecessor to H & B Financial Group), following the model of several major accounting firms who have added investment management to their services. With considerable demand for these comprehensive services, the number of clients grew quickly, and Mike brought Doug Burgdorf on board to bring his expertise to help better serve their clients. On our website, you will find a wealth of information in the form of newsletter articles, calculators, and research reports. We hope your visit will help you understand the opportunities and potential rewards that are available when you take a proactive approach to your personal financial situation. Our website will help you (i) learn about the basic concepts of financial management, (ii) learn more about who we are, and (iii) give you fast, easy access to market performance data. We hope you take advantage of this resource and visit us often. Be sure to add our site to your list of "favorites" in your Internet browser. We frequently update our information, and we wouldn't want you to miss any developments in the area of personal finance.